Welcome to all 2019 Tipsters! Officially FULL in 2019 with 253 entrants!! We are the biggest pub footy tipping in Adelaide. If you can find a bigger one (that is not online) then let us know and we will reward you with a beer. Your Weekly FREE BEER will be loaded Metro Mates computer machine as of the Monday immediately after Round 1 and will appear every week when you swipe your card. Pick the whole season up front...yep, just tip and forget! Pick the winners each week. T's and C's. 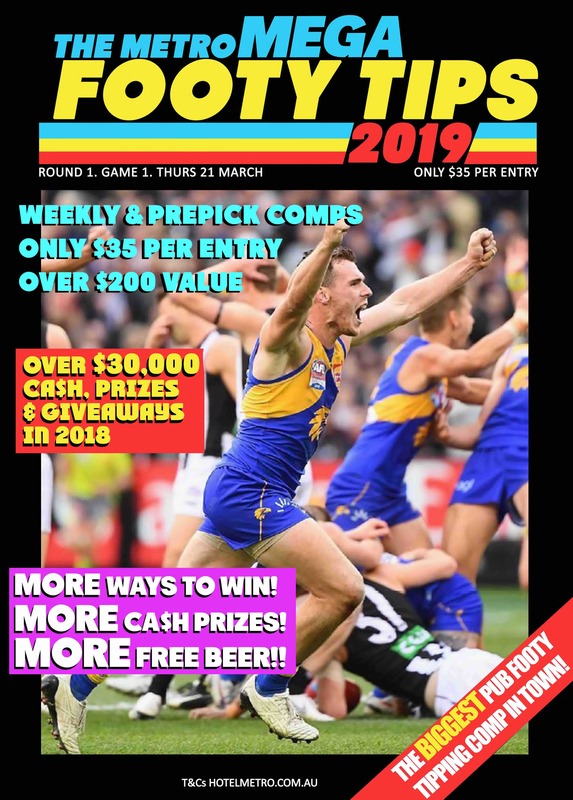 In partic "at the discretion of the organisers" and "correspondence will be given a cursory glance at best"
The overall winner also gets a $500 AFL GF Day @ The Metro with footy finger food and a Bar tab!